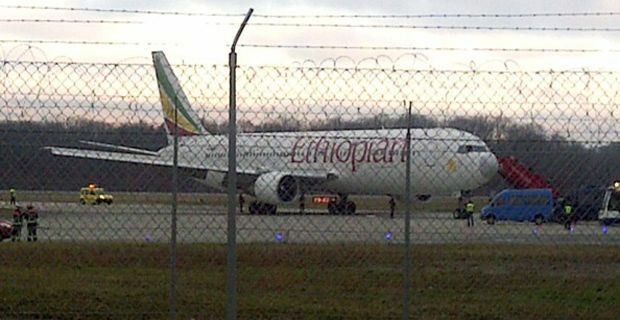 The co-pilot of an Ethiopian Airlines flight from Addis Ababa to Rome has reportedly hijacked the plane he was helping fly and landed it in Geneva. Swiss police say that the co-pilot swung into action when the pilot stepped away from the controls to go to the toilet. He took control of the plane and diverted course, heading away from Rome and homing in on Geneva. Having circled the airport several times, he finally landed the aircraft and the passengers were all able to leave the flight unharmed while the co-pilot himself made a break for it, exiting the cockpit window by shinning down a rope. The motivation of the co-pilot, who is in his early 30’s seems to have been an asylum claim, although one has to question if he did himself any favours by hijacking a plane in the process. A recording of radio communications that has somehow ended up on Twitter clearly indicates his plea for asylum well before he actually landed. There is no suggestion that he was armed, and it is unclear whether his curious behaviour was pre planned or whether it was pure opportunism when the pilot went to relieve himself. Why he couldn’t claim asylum in Rome, the flight’s original destination also remains unclear. An Ethiopian Airlines statement said flight 702 “on scheduled service departing from Addis Ababa at 00:30 (local time) scheduled to arrive in Rome at 04:40 (local time) was forced to proceed to Geneva airport. “Accordingly, the flight has landed safely at Geneva airport. All passengers and crew are safe at Geneva airport,” it said, adding that it was “making immediate arrangements to fly its esteemed customers onboard the flight to their intended destinations.” The fate of the co-pilot remains to be seen, but a cosy life as a Swiss citizen seems most unlikely.